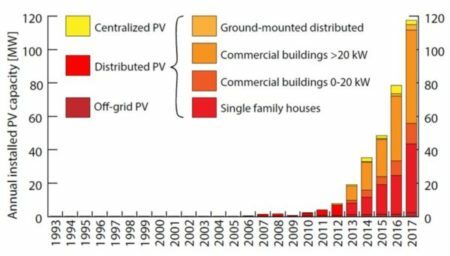 With Sweden as a fast growing and dynamic market for photovoltaic installations, the numbers of PV installation and the production capacity steadily increases. Checkwatt as leading provider in Sweden for complete solutions in energy production and energy consumption for both private and corporate customers continues to increase its customer base and market share. By combining electricity meters, electricity certificate meters and user-friendly visualization, our spin-off company Checkwatt helps its customers to keep track of the entire energy production chain and supports the certification of energy produced and fed into the grid. Checkwatt is proud to announce 1.800 finished system installations based on the IoT gateway developed by CNet. Cumulative installed PV capacity in Sweden. Source: National Survey Report of PV Power Applications in Sweden 2017 by the Swedish Energy Agency.